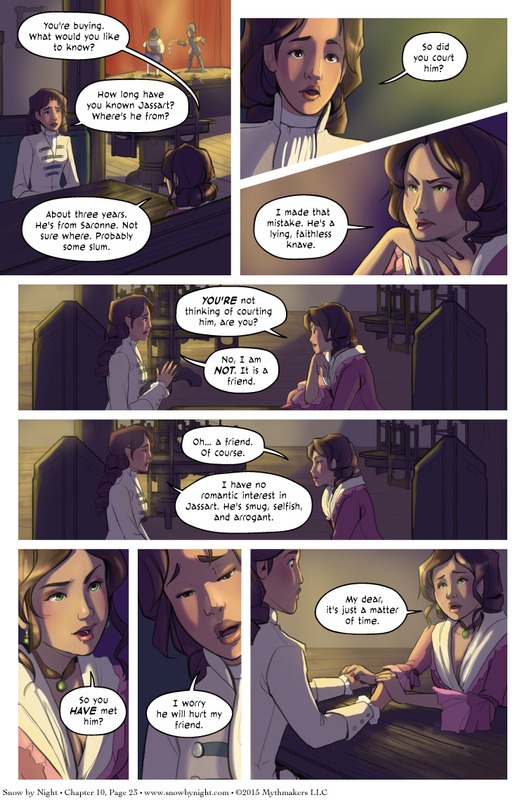 Mathilde confirms Jacqueline’s suspicions on Chapter 10, Page 23. And have you ever wondered what Jassart would look like as a vampire? Vote for Snow by Night on Top Web Comics to find out! If you haven’t been over to see our Kickstarter for Volume 2 yet, you might want to head over now. I’m telling a story about Paws-Tread-Lightly through the updates. So support Snow by Night and get a free comic! What could be better? What was that? Snow-by-Night has a brother? You’ve got that one nailed, Mathilde. Unless, of course, Vivienne knows exactly what she’s doing and he’s going to get a lesson in karma. If he starts messing around with Vivienne I expect he will be getting a lesson in the practical applications of sharp pointy torture instruments. Smug, selfish, arrogant…oh, and a psychopath. You forgot psychopath. I’m not certain that he’s a full-blown psychopath, but he definitely comes across as a sociopath.